Very high energy gamma-ray astronomy represents a rather new and essential window to the non-thermal Universe. One key instrument for assessing this energy domain is the 17 m diameter MAGIC telescope, the currently largest imaging air Cherenkov telescope. Robert Wagner reports on the observation of very high energy gamma radiation from the blazar-type active galactic nuclei Markarian 501, 1ES 2344+514, PG 1553+113, and BL Lacertae with MAGIC. For the first time, flux variability on a time scale of minutes was observed for Markarian 501, allowing the determination of a new limit on the quantum gravity energy scale. 1ES 2344+514 was for the first time observed in a low emission state, whose differential energy spectrum was deduced and whose properties are discussed. PG 1553+113 and BL Lacertae were newly detected at very high gamma-ray energies. 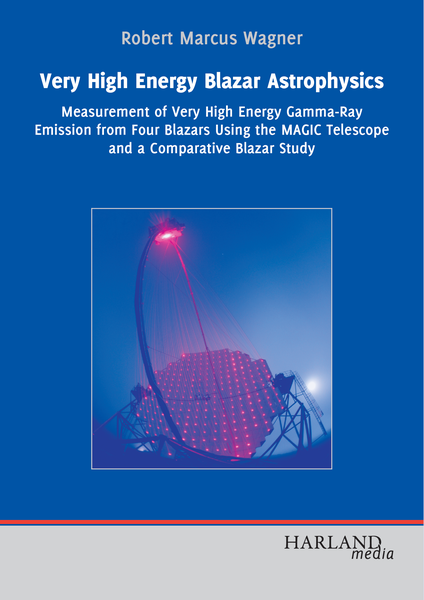 Further a comparative study of all blazars seen at very high gamma-ray energies is performed. The text also discusses the implementation of a fast repositioning system for the MAGIC telescope and the determination of differential fluxes in the MAGIC standard analysis and reconstruction software.